For most of "The Girl Who Died", I wasn't particularly impressed with what I was seeing. It was an amusing hour of Doctor Who and Peter Capaldi felt more comfortable than ever with more jokey material, but it all felt a bit too routine for me until the last act's weirdness elevated matters and cued up an interesting continuation in next week's "The Woman Who Lived". 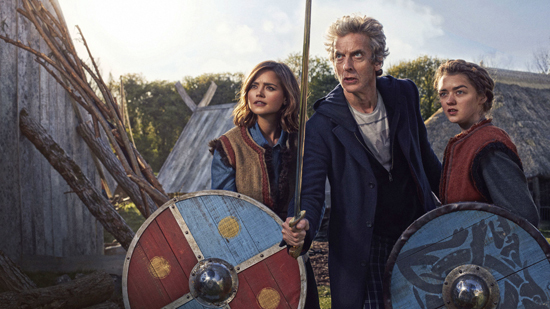 The Doctor (Capaldi) and Clara (Jenna Coleman) arrived in a small Viking village, where they were immediately captured and taken to the chief for questioning. Trying to outsmart their simpleminded captors by making grand proclamations of divinity while using a yo-yo to bedazzle them, The Doctor found himself unexpectedly beaten to the punch by the heavenly appearance of "Odin" (David Schofield)—in a sequence with unfortunate shades of Monty Python & The Holy Grail—who beamed down a squad of armoured henchmen who slaughtered their toughest warriors. Uh, and Clara and a young villager called Ashildr (Maisie Williams), who found themselves in a sort of Thor meets Vincenzo Natali's Cube situation in an alien Mire spaceship. That is until they talked their way free, by arranging an alien vs. viking war the next day. That's pretty much this episode's plot in a nutshell, as "The Girl Who Died" favoured lightweight comedy over anything seriously dramatic or particularly exciting. 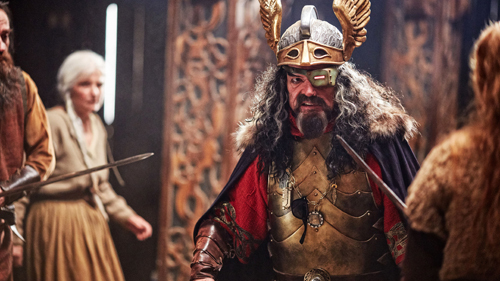 The Doctor found himself having to train a village of feeble, incompetent people in the art of combat. He gave silly nicknames to the most promising soldiers left behind—such as 'Lofty' (Tom Stourton), 'Chuckles' (Ian Conningham), 'Limpy' (Alastair Parker) and 'Heidi' (Barnaby Kay)—and grappled with the idea of potentially altering history to an unacceptable degree by allowing simple folk to defeat a mighty alien species who'd probably have left them in peace had Clara not antagonised "Odin". This was a fun little episode, but it didn't feel essential to me. 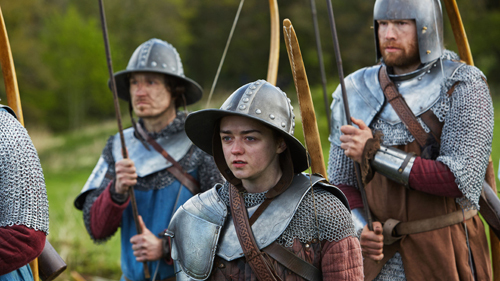 I don't quite understand the sense in casting Game of Thrones' Maisie Williams to play a character living in a similar muddy world to Westeros either, although it seems likely next week's episode will give her better things to do. For awhile this episode was just knockabout fun, but it contained a few unexpected surprises towards the end which was much appreciated: The Doctor realised that his new face was a subconscious choice to remind him about something relating to "The Fires of Pompeii" (which starred Capaldi as Lobus Caecilius, of course); and Ashildr's tragic death saving the village was cured using alien tech that transforms her into an immortal human-alien 'hybrid' (undoubtedly the same mysterious hybrid mentioned in this year's premiere, hmmmmm). Quite what it all means is down to pure guesswork right now, but considering The Doctor seemed to recognise Ashildr when they first arrived in the village suggests she's someone he's met before, and has now become responsible for 'creating' in the past. Time-travel, huh. Some of these questions will hopefully be answered in "The Woman Who Lived", and likely feed into Series 9's mytharc more strongly as we enter the second half of the series. I certainly hope Williams gets something more interesting to do in part two, which seems likely from the 'Next Time' trailer of her dressed as a masked highwayman. Let's just hope she isn't just a weird, teenage amalgamation of Captain Jack and River Song, combined with a bit of the 'human puzzle' Clara was in Series 7. Not a bad episode, and one that could improve in hindsight if the second part cast a new light on it. I liked how The Doctor essentially trained a village of farmers and a girl with a fondness for storytelling and puppetry into a team that could defeat bellicose aliens (even if their enemy's show of strength amounted to just a half-dozen creatures in body-tanks). I just wish there'd been more interesting things going on before the final ten minutes, and even then the curveballs it threw feel worryingly close to things we've seen the show do before. The divisive sonic sunglasses were destroyed in this episode. Forever, one hopes. 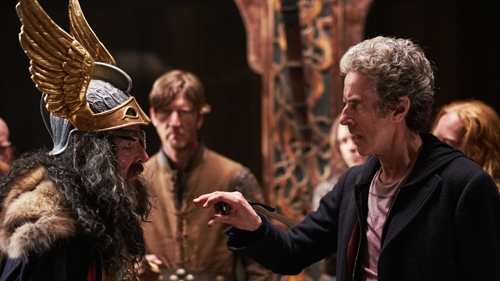 The screwdriver is a far more iconic, visually exciting device to have The Doctor waving around. Shades are, well, just shades. Dull and commonplace. Director Ed Bazalgette makes his Who debut with this episode, although his prequel short "The Doctor's Meditation" was released before the premiere online. The Doctor's two-thousand-year diary is an upgrade on the five-hundred-year one he had in "The Power of the Daleks" and the nine-hundred-year one from "Survival". Ugh, that nonsense about The Doctor being able to translate 'baby-talk' is back. Look, it was a bad idea in "A Good Man Goes to War" and "Closing Time", so why is it still a thing? Can't we just quietly drop it?